Astrophotographer Tamas Ladanyi of The World At Night(TWAN) took this stunning image in Hungary of a shooting star before the start of the Perseid Meteor shower. 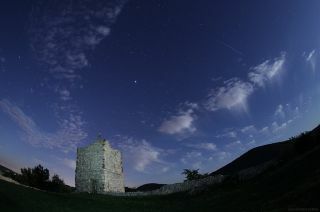 A shooting star streaks across the sky over castle ruins in the small town of Veszprem, Hungary, in this photo taken by an amateur skywatcher. The bright streak was a preview of things to come, as it occurred on Aug. 12, 2011, just a day before the peak of the annual Perseid meteor shower. The image was taken by astrophotographer Tamas Ladanyi of the The World At Night (TWAN). The ruins of the castle gleam against the backdrop of the Bakony mountain range in the stunning photo. The Perseid meteor shower is a popular annual event for skywatchers in which a colorful meteor can often be seen every couple of minutes in the sky. It typically follows the orbit of the Comet Swift-Tuttle but was given its name because the shower appears to come from the direction of the Perseus star cluster. Skywatchers can spot Jupiter in the right side of the photo, and the Pleiades star cluster in the left corner.